Blessed by ‘Maa Bhagwati’ & ‘Shree Sai Baba’ today Vivek Sarna is very well known renowned singer for Bhagwati Jagran, Bhagwati Chowki & Sai Bhajan Sandhya. 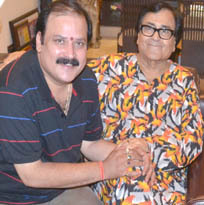 In 1992 in London , at 18 years of age, Vivekji started his singing profession with lagan and ashirwad of Maa Bhagwati. Singing Mata Ki Bhetein and later under the guidance of Sh. Narender Chanchalji, Sh. Mahant Mohan Manavji (Mansa Devi Mandir, Churu, Rajasthan), Mahant Om Nadaanji (Lahore, Mandi Gharana), Sh. R. S. Rajan (Prof. Indian Classical Music, Vocal).